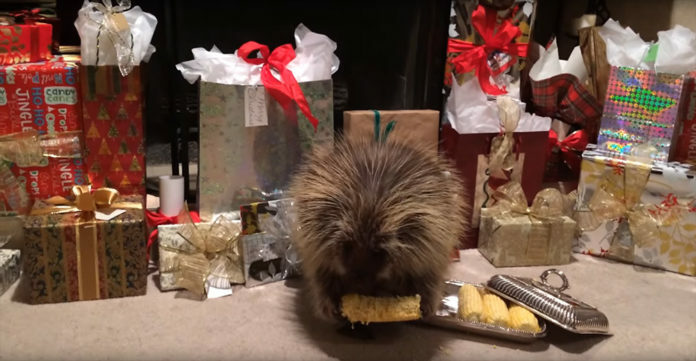 Porcupine Finds Some Treats Under The Christmas Tree. Now Turn Up The Volume To Hear It! At Christmas time, we all indulge a little. It’s the holidays after all! We have all of next year to work off the extra pounds we pack on while having extra helpings at dinner and a little more dessert than normal. That is what makes the holidays so fun! Those of us who have pets will buy an extra special treat for our furry family members. We usually splurge and get a special can of good-quality canned food for our dogs to enjoy on Christmas day. The porcupine in this video is enjoying his Christmas treat! His name is Teddy Bear, and he loves corn! He just so happened to find a corn cob under his tree and couldn’t resist! You will want to hear how cute Teddy Bear is as he enjoys his treat! I have never met a porcupine in real life, after watching this, I can see how some people love them! Share away, people!